We also participated in the production of Fin de concession (2010 - Pierre Carles) and in the theatrical distribution of Mourir ? Plutôt crever ! (2010 - Stéphane Mercurio), and our team have made Merci Patron ! (2016- François Ruffin). The society also develops an activity of video publishing (DVD and VOD). The available DVDs with english langage are presented below. With the tremendous success of his book, A People’s History of the United States, Howard Zinn radically changed the way Americans see themselves. His friend Noam Chomsky says that Zinn litteraly transformed a generation’s conscience. Zinn talks about those who have no voice in the official History : Slaves, Indians, deserters, textile workers, union men. On two occasions in Paris and Boston we were lucky enough to meet and film him. Towards the end of his life, Howard Zinn said , ‘‘I want to be remembered as someone who enabled people to experience hope and power something they never did before.’’ That is exactly the reason why we want to make this film. Between 1900 and 1920, like Howard Zinn’s parents, more than 14 million immigrants arrived in the United States. They came fleeing poverty or war, racism or religious persecution. They dreamed of a promised land, of wealth, or simply of a better life. The New World opened its arms wide to the poor and huddled masses of the Old: its unwanted, its fugitives, and even a few utopians... After all, the rapidly expanding industries of the time required cheap labor, and immigrant workers - men, women and children - were easy to exploit. But the same period also saw the birth of organized labor, with its strikes and conflicts, and the appearance of great figures like Emma Goldman, Mother Jones, Eugene Debs and the Wobblies. In 2007, we were shooting Chomsky & Co, a documentary based on the philosophy of Noam Chomsky. The leading linguist and world-famous political essayist had been Howard Zinn’s companion during the struggle waged by activist movements opposing the Vietnam War. The decision to meet the author with a camera seemed like a perfectly natural next step. Thus, in May 2009, we went to meet Zinn at Boston University and continued filming interviews during his visit to Paris in June of that same year. Although he was 87 years old, this bright-eyed man’s enthusiasm made us forget his advanced age. He passed away several months later. The power and richness of the interviews he granted us were so great that we have decided to make a film by shooting additional sequences in the United States and in France and by exploring American and French archive images. In our documentary, Zinn draws us into a story that encompasses the era from the Crash of the Great Depression in 1929 up to 2009. 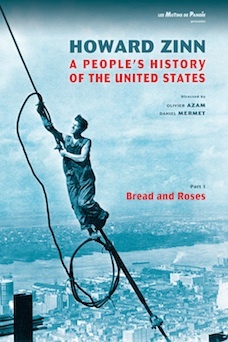 Born into a working-class family, Howard Zinn grew up in New York during the Great Depression. Bombardier in the US Navy fighting against fascism during World War II, confirmed pacifist post-Hiroshima, a teacher committed to the cause of young people fighting for black American Civil Rights, leader of the movement against the Vietnam War, a playwright whose work has been performed worldwide and author of the seminal work: A People’s History of the United States, 1492 to present. This man, whose life spanned the 20th century, offers us an analysis illustrated with exceptional personal experiences and rarely revealed historical facts. What exactly occured in French prisons between September 1971 and the end of 1972 ? For the very first time in French history, prison inmates collectively initiated prison revolts that lead to a take over of their prisons, to the occupying of prison roof tops and to the direct communication of their demands to the public. During that time over 35 listed mutinies occured, two of which left a mark on the collective conciousness in France. The first mutiny took place in Toul, in North East France in early September of 1971. The second mutiny broke out about a month later and 40 kilometers away from Toul, in the prison of Nancy, in the heart of downtown. Now, 40 years later this film dusts off that long-forgotten page of social struggle, by by putting in the limelight those who lived it, initiated it, repressed and supported this movement of revolts : The Mutineers of Nancy’s prison, a prison warden from Toul, leading lawyer Henri Leclerc, sociologist Daniel Defert and ex-convict, writer and political activist Serge Livrozet. In October 2010, France is seething with unrest. The pension reform laws are met by popular outcry. For the first time since May 1968, there is a shortage of fuel. The refineries are blockaded. Olivier Azam (director of Chomsky and co) was embeded into the picket line of this big strike. Devoted son of Holocaust survivors and ardent critic of Israeli foreign policy. Uncompromising even in the face of his denial of tenure at DePaul University, Finkelstein is revealed as a complex, politically isolated figure who puts the pursuit of justice above the security of his academic career. As he explores the difficult and deeply-felt issues at the heart of the Palestinian-Israeli conflict.